Just a quick update in case you missed the email. 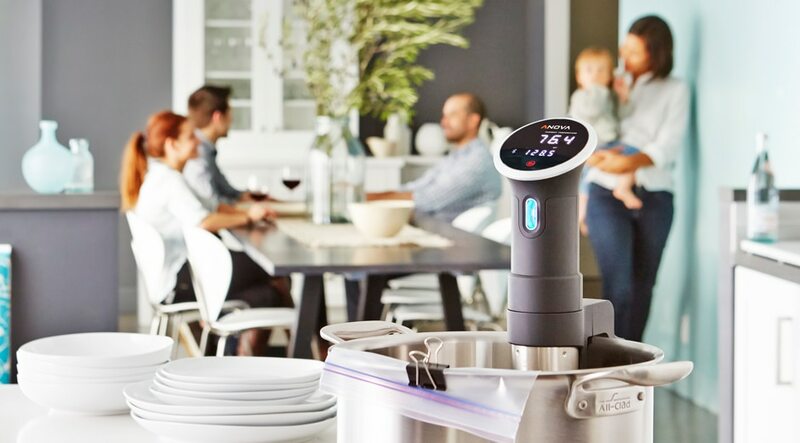 We recently announced that the MultiCook function for the Anova Nano will be delayed until October of this year. To clarify, this is a software functionality, not hardware, so your Nano you'll be receiving (SOON!) will have this functionality once enabled in the app. How about for the Anova WiFi? I thought the multi-cook was suppose to be out by now, so got rid of my BT version (as I gather that will never support multi-cook), and got a second WiFi version. But the app still doesn't seem to support multi-cook. The feature hasn't been implemented into the app at all yet. Per the help desk article, the feature will eventually be available for all of our current models. It's taken a long time; you mentioned in a post in June 2017 that the feature was coming soon, which was why I replaced the BT unit with a second WiFi unit, as I though 12 months was more than sufficient time for your company (and not a Kickstarted project). Well, that was actually a little presumptuous on your part to replace your BT unit with the Wifi unit. The Nano will support this feature and it only has BT connectivity. The article that Bill references in the post that kicked off this thread gives a timeline of October 2018 for the current ETA for this feature. Anova's a small company. They don't have the resources that a Microsoft or Apple have for cranking out features in short timeframes. You'll get it when you get it. Be thankful they're enhancing the functionality of product you already own. (many companies don't - and use that as the "carrot" to get you to buy new products). I thought Electrolux was a largish company; sorry if I was wrong. Electrolux is definitely pretty huge! Anova Culinary itself is still a small team. The management/shareholders did the right thing from their point of view. Pumped up the books with a load of pre-orders for a product they can never deliver on time, sold the co to a big multinational company and cashed in. Screw the customers in the meantime. They can wait. The whole launch of the nano was questionable and now with news that it's going to be launched half a year late with one of its key features missing is beyond a joke. Everything I have criticized the Nano for has come true. Sadly. I really feel sorry for those who waited this long. I do hope that Electrolux step in and manage this properly. I would say they are not handling it well. Originally there were three options. Wait for nano, upgrade to Bluetooth or refund. Now it is only refund or wait. I wanted to wait to get multicook which is not on the Bluetooth version. I would have even paid a little more for the WiFi version to get multicook. Now I have nothing. We were bought by Electrolux well before Nano pre-orders were even released. I don't want to start splitting hairs but that one isn't a fair point. Fair, balanced and warranted criticism is welcome, read, and I do my best to reply to what I can. I think perspective is important in all of this as well - We're delayed, and its significant. Over a year is unacceptable in any situation and its not a position we wanted to be in. We are working to fix it, we are working to ship the Nano at a quality level we are comfortable with and we are working to ship the MultiCook feature. We've communicated where we're at with Nano, and what the plan with MultiCook is. I'm genuinely sorry we couldn't meet your expectations. Anova's a small company. They don't have the resources that a Microsoft or Apple have for cranking out features in short timeframes. I've been developing software professionally for 30 years, 18 of that with a small company (we average just shy of 25 employees at any given time) that develops both custom and turnkey large-scale fault-tolerant solutions for wireless telecom service providers in at least 12 countries (that I can think of off the top of my head) on 5 continents. We have a grand total of 6 people doing all of the technical design and implementation, and 2 production QA testers. We routinely implement complex features, which usually involve solving very thorny technical problems, complying with numerous international legal requirements, etc that run on heterogenous systems, going from concept to production implementation in half the time (or less) that the Multicook feature has taken so far, and which is still vaporware...11 months after it was announced...and is not expected to be delivered until another ~5 months from now. The first version of the O/S that was to become Unix was developed by an even smaller team in about a month in 1969, using tools that by today's standards were (with apologies to Mr. Spock) the computing equivalents of stone knives and bear skins. These days, individuals sitting in their jammies in front of home PCs churn out features for mobile apps they developed in their spare time for fun, and usually do so faster than what we're seeing happening here. You don't need the resources of Microsoft or Apple in order to deliver properly functioning software features in a reasonably timely manner...especially relatively trivial ones like Multicook. You just need dedicated and competent management and staff. @Bill, Fair enough, I take it back. The timing doesn't fit. However one of many ways to deceive the new shareholders could still stand (and the customer experience is just collateral damage; you're sitting on their money aren't you?). There are many ways to skin a cat. Say if the management needed to show results after Electrolux stepped in because it could be that Electrolux (as part of buying in) set the management financial targets to meet and the Nano pre-order 'scam' was one way to do it (it's so overdue now, I think it's fair to call it a scam at this stage!). Whatever happened, something is rotten at Anova and the customers can smell it. Hey zqushair - while we always welcome constructive feedback, conspiracy theory level stuff isn't needed nor welcome here. We've all worked our butts off to produce a product that hasn't shipped yet, and as I stated above its definitely not our intended goal. We've offered full refunds to our customers, we've offered full refunds then you can re-buy the Nano at your pre-order price when it is released, we've offered an exchange for a more expensive device with no cost to the customer (Bluetooth), and we've offered additional discounts on Bluetooth/WI-FI while still retaining your Nano pre-order. Short of shipping the device on time, I'm not sure what else we could've done to improve the situation. So, - I'm all in for constructive feedback but just blanket fear mongering isn't welcome. Take care. Good God !! I cannot believe what I’m reading. This is a cooking device and not something that should be treated like there is a large company conspiracy to defraud. Please treat this site as it should be, as a adjunct to a very useful cooking item and keep all else out of it. I am very happy with my WiFi model and use this site to help me with it. Please stop mudding the waters so to speak.